Rhun Ap Iorwerth (Ynys Môn):Will the Cabinet Secretary make a statement on train services following Transport for Wales's public apology for shortcomings in services? Transport for Wales (TfW) and Network Rail took out full page ads in the Western Mail, South Wales Echo and Daily Post on Tuesday. They said 36 of Wales' 127 trains are being repaired - causing delays and cancellations in recent weeks. TfW and Network Rail admitted passengers "deserve better". Ken Skates says "Transport for Wales is implementing a recovery plan and passengers will see consequential service improvements each day over the next few weeks". Mr Skates adds that Transport for Wales inherited "an ageing, appalling fleet of trains". Mick Antoniw (Pontypridd): What discussions has the Cabinet Secretary had with Cardiff Airport in light of reports that the airline Flybe is to be sold? Ken Skates says he has held discussions with airport executives, and stresses that a sale is "just one option the company is considering". Flybe warned full-year losses would be £22m, blaming falling consumer demand, a weaker pound and higher fuel costs. The airline flies from Cardiff to cities including Paris, Berlin, Rome, Munich, Milan, Geneva and Dublin, and Mr Skates says there are "no plans for a radical change to the route network, no plans whatsoever to ground planes, and no plans whatsoever to cut the number of routes". Flybe has helped increase passenger growth from one million in 2012 when the Welsh Government took it over to 1.5m in 2017. Gareth Bennett UKIP raises the benefits of dementia-friendly training for staff in many walks of life. Alzheimer's Society figures show dementia affects around 45,000 people in Wales and experts fear this number could rise by 40% in the next 10 years. Mr Gething says Wales has an ambitious plan to improve care for sufferers. Conservative Janet Finch-Saunders raises concerns about a north Wales residential and nursing home specialising in care for elderly people with dementia following an investigation by S4C current affairs programme Y Byd ar Bedwar. An undercover journalist worked at Y Pines in Criccieth over a period of a fortnight as a care assistant, initially shadowing other staff. She witnessed a series of concerning incidents which were captured on a hidden camera. Huw Irranca-Davies says he saw Y Byd ar Bedwar but cannot comment as investigations are underway. Minister for Children, Older People and Social Care, Huw Irranca-Davies admits there is a "paucity of data" but says he has commissioned work to address this. How many registered nurses and care home workers from countries within the EU? 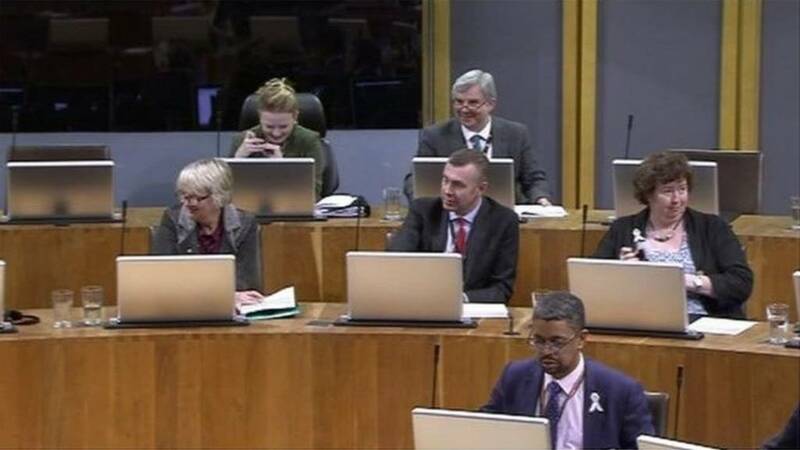 Plaid Cymru's Helen Mary Jones asks how many registered nurses and care home workers from countries within the EU are currently working in care homes in Wales. Vaughan Gething says a pilot scheme is underway for online HIV testing in the Hywel Dda health board area. We move on to Questions to the Cabinet Secretary for Health and Social Services, and Labour leadership contender, Vaughan Gething. Joyce Watson has the first of the tabled questions once more (a computer randomly selects the order in which the questions are to be asked in plenary). Her question is: Will the Cabinet Secretary make a statement on increasing the opportunities for people to test for HIV, including within community settings, through self-testing and home-sampling? Last week, Prince Harry made a plea to end the stigma around testing. UKIP's David Rowlands raises the issue that "almost half of our new graduates are working in non-graduate jobs". Welsh language minister Eluned Morgan tells Plaid Cymru's Sian Gwenllian she "hopes" the Welsh language bill will be passed before the next assembly election in 2021, but "you are aware of the mess that is happening with Brexit, and that's the only reason I can't make the commitment I'd like to, because of the chaos surrounding Brexit". Lessons from German dual training apprenticeship model? Conservative Mohammad Asghar asks whether the Welsh Government could learn from the German dual training apprenticeship model. Eluned Morgan says it would be "very difficult to pick up their model and plant it here". David Melding, born on 28 August, says "I think I was often 18 months behind people in the same class year as me. "It caused reading and writing difficulties when I was in primary school". Kirsty Williams says "our school admissions code is clear that admission authorities should consider requests for admission outside the normal age group carefully. Any decisions should be made on the basis of the circumstances of each case and in consultation with the parents and the school, and specifically in relation to what is most beneficial to the child." She says a school admissions code review has started, and as part of the review the Welsh Government will work with admission authorities to ensure that they are applying the guidance consistently. Plenary gets underway with Questions to the Cabinet Secretary for Education Kirsty Williams. The first of the tabled questions is by Joyce Watson: Will the Cabinet Secretary make a statement on the school admissions code as regards summer-born pupils? In England, there are moves for councils to ensure that children can be admitted to reception at five if this is what their parents want. Some people want Wales to follow their lead, saying local authorities can currently simply refuse requests without explanation. That's the end of the budget scrutiny with the Cabinet Secretary for Economy and Transport. Senedd Live returns for plenary at 1.30pm. Hefin David says some of the language in Ken Skates' paper to the committee "is so opaque as to generate some very weird images". He quotes Ken Skates' words - "I have been clear that we are taking an iterative approach to implementing the Economic Action Plan (EAP), working with our partners...It is important that decisions are not made now that limit our scope in these areas". Mr David says it "generates an idea of going around in circles until you have improved to a point and you decide to stop and make a decision". There are around 730,000 concessionary bus passes in circulation throughout Wales, the committee is told. Pressed by Bethan Sayed about the main issue with the rail franchise, Ken Skates replies, "inheriting rolling stock that is old, and historically I believe insufficient wheel sets have been ordered in preparation for autumn". "There will be a programme of refurbished rolling stock appearing from the spring of next year," says Simon Jones, the Welsh Government's Director of Economic Infrastructure, on the Transport for Wales franchise. Joyce Watson refers to the delays and cancellations on rail services in recent weeks. More than a quarter of trains in Wales are currently out of service, rail bosses admitted in newspaper adverts apologising to passengers. Ken Skates says "autumn is the worst time of the year to take on a rail franchise, but I am determined to ensure that Transport for Wales address the problems we've faced over the last four weeks".